We are a gambling platform with a fresh and creative look at the traditional gambling. The platform is build utilising the blockchain technology - we've structured the use of smart contracts on EOS blockchain, to ensure speed, proved fairness, scalability and the best games. All of our games are expertly build in house and we currently offer Dice, with the Black Jack just around the corner. Soon to roll out Roulette, Sick Bo, Baccarat, Last Hero and other games. Exceptional user experience is at core, that’s why we bring our vast experience in gambling, blockchain, operations and R&D, to enhance your’s. Team consists of the top managers, each bringing at least 5+ years of expertise in their fields. We know what our players want and expect from us, and we’re here to bring it! Your success is our success, that's why we offer some unique features to deliver even more fun and success: rewarding dividends program, jackpot, affiliate program, leader boards. Play and win. Test your luck. 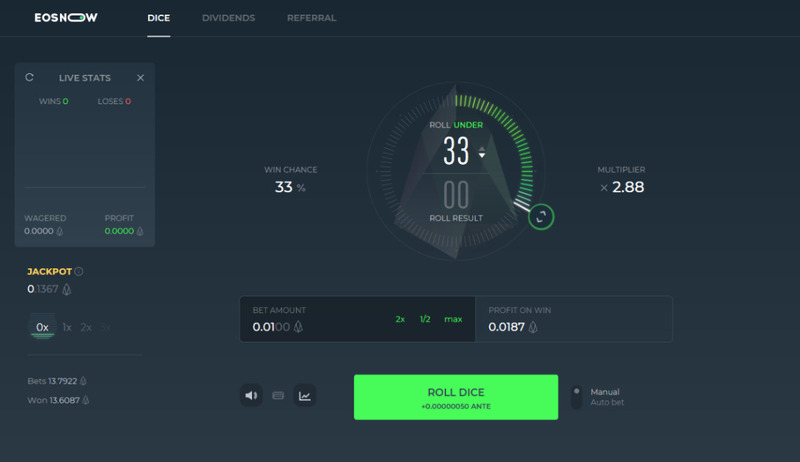 Mining utility bot for EOS based dice tokens.